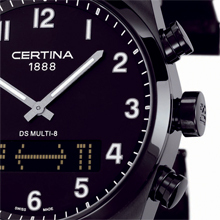 A forward-thinking philosophy and innovative ideas have long been CERTINA hallmarks. The Swiss sportwatch specialist introduces the all black DS MULTI-8, a novel timepiece that is both flexible and worldly, with a quartz analog-digital heart of great technical refinement. The masculine, sporty DS MULTI-8 will appeal to travellers and people on the move, with its multiple easy-to-use functions, as well as dynamic good looks and full-black PVD coated case. The DS MULTI-8 All-black version is equipped with the same, unique ETA 8-function analog-digital movement as the original DS MULTI-8, housed inside a sporty black PVD coated case. It brings a highly useful array of features to this timepiece, such as twin "time-swap" timezones over its analog HM hands, and full calendar-week information, alarm, timer and chrono functions over its digital display. Professional and action-ready at first glance, the DS MULTI-8's technical nature comes alive at the push of its three control buttons, which also activate the sharp backlit display. Time here or time elsewhere available in an instant, according to your own favourite settings, and alarms available for both distinct timezones. An active traveller's delight, with acoustic and vibro alarm! In a gorgeous, oversized 316L stainless steel case with PVD black coating in contrasting finishes—finely brushed lugs next to polished case sides and bezel—the DS MULTI-8 is at ease in any dynamic setting, business environment or sporty escapade. Its sapphire crystal is treated with anti-reflection coating on both faces, to ensure optimal reading of hands and digital display. Its black dial is sporty and modern, and a generous amount of Superluminova on its HM hands and Arabic numerals, ensures perfect readability under all conditions. The DS MULTI-8 sports three beautifully finished push-buttons to operate its various functions. The upper and lower buttons are slightly smaller while the central button, larger and thicker, carries the symbolic 'DS' monogram upon its smoothly rounded tip. 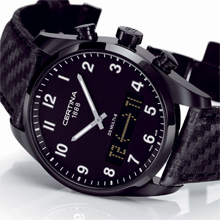 Equipped with the CERTINA DS Concept, the watch is also water resistant up to a pressure of 10 bar (100 m). The DS MULTI-8 All-black comes with a black carbon-fiber-look leather strap with matching black PVD twin-pushbutton butterfly clasp.